Hundreds of miles of cycle routes could be created across England following a move to make it easier for councils to scrap outdated local laws. Bicycles are banned by-law from parks, seafront promenades and other public spaces in many parts of the country, forcing cyclists on to busy routes as they make their way to work. Grant Shapps, the Local Government minister, will tomorrow announce he is telling councils they no longer have to receive permission from Whitehall to remove restrictive by-laws. The initiative is part of a government effort to remove the red-tape facing many councils and to devolve decision-making to local communities. But Mr Shapps said it would also have a spin-off by improving cyclists’ safety and encouraging people to use bikes. He told the Independent: “There have been some crazy by-laws in place from the year dot stopping cycling from taking place. This should enable local people to scrap laws stopping people from getting on their bikes." He urged town halls to re-examine their by-laws to identify routes away from busy roads that can be opened by to cyclists. *Worthing, where the council also opened the promenade to cyclists. *Harrogate, where cyclists will be able to use designated routes across the Stray, open land in the town centre, following changes to by-laws coming into effect next month. Making it easier for local authorities to create cycle routes on the non-highway land that they control is certainly a step in the right direction. Making it easier will not, automatically, cause local authorities to create well-designed off-road cycle facilities that will integrate satisfactorily with the road network and not cause problems to pedestrians. This does rather depend on the local political will being present, having the correct impetus from local campaigners, and the presence of competent officers who understand cycling and can design usable, well-thought-through schemes (a very limited resource). 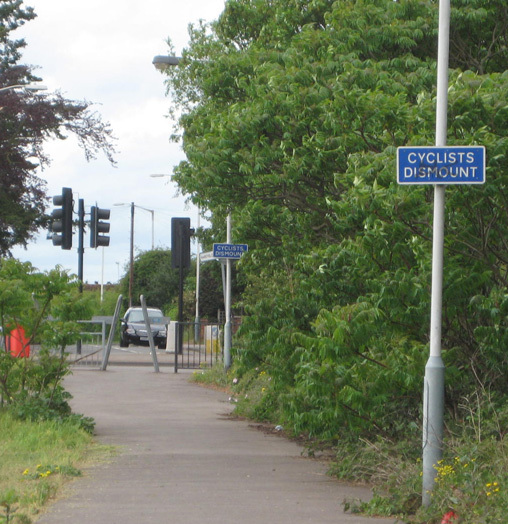 In the past, even when, under the existing legal regime, councils have decided they wish to create cycle routes through open spaces and parks, and have pushed it through, the results have all too often been virtually useless from the point of view of encouraging utility cycling, because of mis-conceived arrangements like this being put in place. 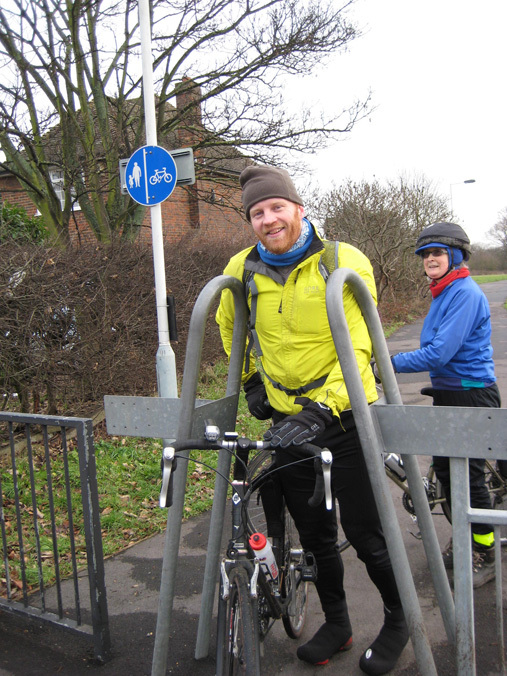 This ludicrous cycle-blocking gate is one of a couple to be negotiated in a few hundred yards on this parkland "cycle route" in the London Borough of Hillingdon. This is adjacent to Park Road and Western Avenue, two huge dual carriageways connected by a motorway-style intersection on which cyclists should not be expected to have to cycle. Yet the other choice cyclists are being given is this. Sorry, Hillingdon council, it ain't going to work. This is why you have less than 1% of journeys in Hillingdon by bike. One of the examples mentioned by Grant Shapps was the promenade in Worthing. Here is an account of the gestation of that route from The Argus of 5 August 2009. The Government has sanctioned a change in bylaws to allow cyclists on Worthing prom between Splash Point and George V Avenue from August 28. The borough council hopes new signs will be in place by then, allowing the 12-month trial to start. The issue has divided Worthing, with views for and against evenly split. Critics believe the promenade should be for walkers only, and fear an accident similar to one which happened about 15 years ago when a woman pedestrian suffered brain damage in a collision. The council was forced to pay out more than £100,000 in damages and the cycle lane between the Lido and George V Avenue was scrapped. But cycling campaigners said far more cyclists have been killed and seriously injured on roads since then. The council has decided on mixed use of the promenade instead of a designated lane. Councillors also rejected calls for a speed limit, claiming it would be unenforceable. Jim Davis, chairman of Worthing Cycle Forum and Worthing Revolutions cycling campaign group, said he was very pleased the trial was going ahead. He said: “Obviously we now need to focus on promoting safe cycling. The whole point is to enjoy the prom and not to treat it like Manchester Velodrome. “The problem with having a speed limit is it calls for additional signage. It is also difficult to police and enforce. “What's needed is a campaign to make people aware that the prom is for everybody. “The prom is there to enjoy, not to get from A to B quickly. “I am anticipating some small conflict, primarily because it is something new, allied to the fact that people will remember the regretful incident 15 years ago. Mr Davis conceded that it would take only one “idiot” on a bike to ruin it for everybody and scupper the trial. Coun John Rogers, the borough's cycling champion, said: “It is great news, something people have been waiting for for a long time. He said the trial would be monitored and a report presented to the council after a year. Coun Bob Smytherman said mixed usage was a “recipe for disaster” and feared for youngsters walking into the paths of cyclists. The list of comments and opinions here are the typical ones you will get when discussing any of these off-road cycle routes anywhere in the country, from seaside promenades to Hampstead Heath and the Royal Parks. In the two years since this discussion, I have heard of disasters in Japan, New Zealand, and other places, but not Worthing, so it appears Cllr Smytherman's fears were misplaced. Strange how he also seemed not to be worried about youngsters walking into the path of cars. And it is interesting how they had to go back 15 years to find a case where a pedestrian "suffered brain damage" in a collision with a cyclist. I suspect they would not have had to go back so far to find a case of a cyclist being killed in a collision with a motor vehicle in Worthing. And it is interesting how that caused the council to close a cycle route. How often does it happen that a road gets closed to motorists because one of them kills a cyclist? It never does. Another thing that never happens is that people like Worthing's so-called "cycling champion", Cllr. John Rogers, suggest that motorists, or indeed pedestrians, or public transport users, must "earn" safe or convenient infrastructure by "behaving themselves". When did you ever hear a minister declare "We will build no more sections of trunk road or motorway until all motorists stop exceeding the speed limit, using their mobiles while driving and knocking down pedestrians and cyclists", or a councillor declare "No more bus stops for those unruly passengers who won't queue properly but push in". Cyclists in the UK have this unique distinction: so undeserving of basic human considerations are they, as a species, that they must "earn", by "good behaviour", the facilities they need. No wonder we are stuck on the 1% mode share. I am not a great supporter of "shared space", and believe that, for off-road facilities, if cycle flows are expected to be at all high, as indeed they should be, if a facility is successful, that cyclists should be segregated from pedestrians. This does seem to be the norm in the high-cycling states on the continent. We get it sometimes in the UK, such as The Broad Walk, Hyde Park, a well-established example, or on Brighton sea front, where they have the added weird markings as shown here. But at least they don't have the Hillingdon mantraps. While Grant Shapps' announcement is to be welcomed, hopefully the government is not imagining that the creation of cycle routes through parks and on promenades is "the answer" to safe cycling, as it clearly is not. In the London Borough of Brent, for example, while more routes through parks would be welcome, and, indeed, the difficulty of changing bylaws has been given by the council as an excuse not to have made more progress on this, all the routes through parks and open spaces that could be imagined would not actually do much for cycling here, because, after a very short distance, for almost any useful cycle journey in Brent, the cyclists is going to have to go on to a big, nasty road. The urban landscape is cut up by railways and waterways, and the only ways through from one neighbourhood to another are the bridges that take heavy traffic on the main roads. In any environmental context, it needs to be understood that utility cyclists are normal people and they need to go to the places that normal people need to go to, such as schools, shops, workplaces, libraries, all of which are in general connected up by the main road network and cannot be accessed in any other way. To really encourage cycling, as they have done in other European states, you need whole route solutions for real journeys, and you need to make these safe, convenient and conflict-free (vis-a-vis motorists and pedestrians) from one end to the other. Isolated local interventions, UK style – a bit of an improvement here, a bit of an adjustment there, "pepper-potting", as Freewheeler calls it, won't work. You need end-to-end quality. Routes through parks, on promenades or across open spaces, on towpaths, or, indeed, on minor roads, while making a contribution to a good cycling environment, if well-executed, don't generally provide end-to-end solutions for real journeys. The main roads still have to be tackled. I would like to change out moded by laws on common land. Wandsworth Borough run Tooting Bec Cmm. and waste money on banning cycling (except on limited cycle paths) on the common, by sending Parks Police to stop cyclists. Does anyone know how we can encourage them to allow responsible cycling on all wide paths?